Color can lift your spirits faster than almost anything else. Have you ever noticed how your mood is transformed when the sky is blue after a series of dull gray days? The same thing happens when you transform your walls from a color you never liked— or never noticed— to the perfect shade. With the right color choices, you will fall in love with your rooms again! Depending on the color, you may feel energized or relaxed, but either way you’ll definitely feel inspired by a color transformation. Almost anyone can paint a wall if they take their time; and at $20 – $60 a gallon, paint is the cheapest decorating tool. The possibilities are endless. Start by picking a color in one of your fabrics and then see what else works with it. You can even look at your wardrobe for clues about what colors appeal to you. In this ensuite bathroom, Debra Gould echoed a color found in the bedding of the master bedroom. The choice pulled the two rooms together in a calming way. Six Elements president, Debra Gould created the Color by Design™ process to help her color consulting, interior redesign and home staging clients reinvent their space. The considerations are different when recommending wall colors for a home that you’re selling or one that you’re planning on living in for years, but in both cases Gould brings her experienced and objective eye to the task. Thousands of possibilities are expertly narrowed down to a small group of colors and the client is able to quickly make a final and stress-free choice. 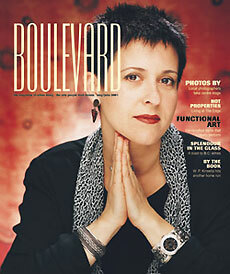 Debra Gould is "as color conscious as Matisse" says Boulevard Magazine in this 2001 cover story. The simplicity of the process is a dramatic change for the countless couples who have lived with paint swatches taped to their walls for months unable to make a decision! When you walk into a room, what is the first thing you notice? Wall color is the first thing anyone sees when entering a room— it will even distract from less than perfect furniture or dated finishes! That’s partly why it’s the cheapest decorating tool. 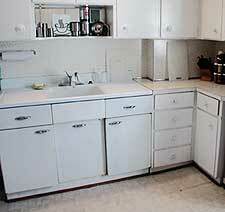 For example the 1930s kitchen pictured below was headed for demolition until Gould completely transformed it with paint. The changes saved at least $30,000 in renovations, not to mention the considerable disruption of living without a kitchen for 60 to 90 days! Ironically, when the home went on the market 5 years later, the buyer commented that the eye popping kitchen was one of the reasons she bought the house. This was despite this house competing with fully renovated kitchens in other homes in the same price range. 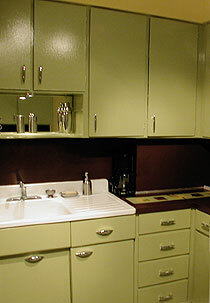 This kitchen looks dramatically different with bold colors and new cabinet hardware. Even the 1930s arborite back splash and counter top were transformed with melamine paint— not a permanent solution, but it still looked great after 5 years when the house went on the market! This kitchen makeover by Debra Gould was featured in Woman’s Day Magazine. Going bold: What’s the worst thing that can happen? 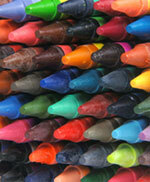 Remember the joy of a new box of crayons, especially if it was the larger pack with more colors? We are born with a love of color but sadly over the years many of us are conditioned to fear picking the wrong one. With thousands of colors to choose from, most people opt for “builder beige” or white because they’re overwhelmed and afraid of making the wrong choice. Or worse, they’re afraid of “what other people will think”. If you always stick to beige and white, you won’t offend anyone, but you probably won’t have a room that you or anyone else walks into and says, “wow!” In rare cases you might achieve a “wow” effect without color, but your furniture, accessories and art will have to work that much harder. With paint companies now offering giant paint swatches and little trial-sized pots of paint, taking a color ‘out for a test drive’ has never been cheaper or easier. If you go with something bold and hate the look, try again. Having to repaint a wall is not the end of the world and certainly shouldn’t stand in the way of trying something new. This home had aluminum siding that couldn’t be changed. 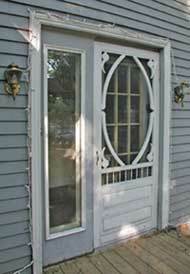 But look at the increased curb appeal just from painting the trim, door and adding coordinating (but inexpensive) lights. This house was transformed inside and out as part of a home staging project by Six Elements. Why wait until you’re selling to make changes that can also increase your own enjoyment of living there? Feeling “stuck” looking for the right colors? “Many of my clients call me after they’ve spent months with color swatches taped to their walls, or worse, a huge blob of color in the middle of the wall and then they can’t decide whether to go for it or not,” says Debra Gould. 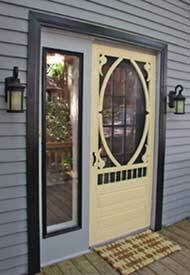 She arrives with a color kit of 1200 to 1500 large swatches, for an in-home Color By Design™ consultation. Within two to three hours, Gould develops a color palette for your entire home, including sheen levels, ceilings and trim. Gould will identify the “safer” color choices from a range of off whites and mid-range neutrals. Plus she identifies alternatives that are more daring— the kinds of colors you might have always admired in other people’s homes but felt afraid to commit to in your own house. 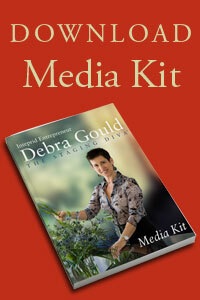 With Debra Gould guiding you in these choices, the “risk” of stronger colors is minimized. Choosing a color palette you will want to live with is very different than choosing one for a home that’s being decorated to sell. Color and Home Staging expert Debra Gould is experienced at both tasks and will approach them differently depending on your needs and plans. Debra Gould's color choices create a warm and inviting living room. “When I’m choosing paint for home staging, I can quickly come up with a palette of colors that will appeal to home buyers,” says Debra Gould who is also the author of Staging Diva Ultimate Color Guide: The easy way to choose colors for home staging projects. If you don’t have your own color ideas and you don’t have a file of magazine clippings of things you like, don’t be afraid to contact us for help. Not everyone has a conscious awareness of the colors that appeal to them. The Six Elements Color by Design™ process will guide you every step of the way to finding the right colors for your redecorating project. 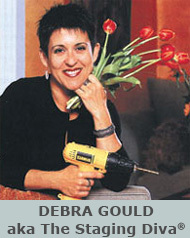 Debra Gould will start the color discussion/exploration with careful observation of what’s already in your home (including art, collectibles and perhaps your wardrobe) for clues about what colors you are drawn to and find appealing. She will show you a number of color books. These are filled with photos of different rooms, styles and moods and help you find the look that appeals to you. From there Gould works with you to develop a unique color palette for your home that is a reflection of how you want to live in your space. There are many photos and articles on this site to give you a better idea of our work. 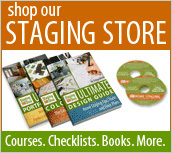 Often color is part of a home staging or interior redesign project.